Home » Feature » December 2012 Call for Support! December 2012 Call for Support! 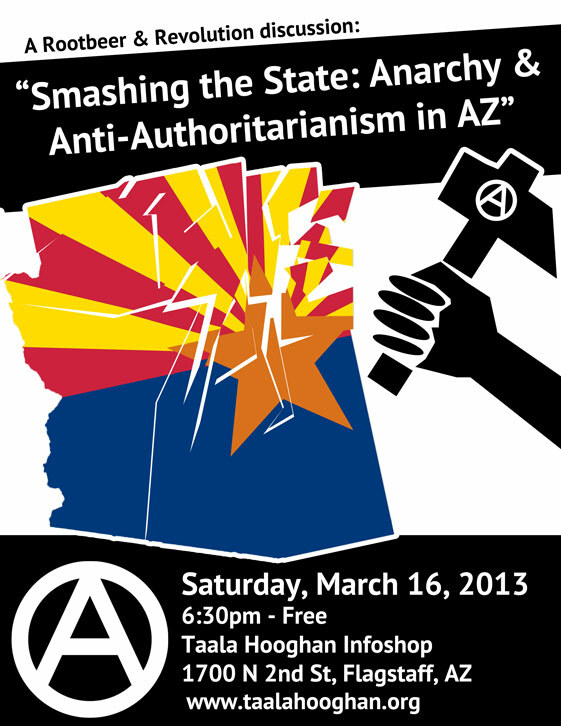 Greetings to our friends, supporters, & accomplices! 2012 has been an exciting, effective and challenging year for Táala Hooghan Infoshop. 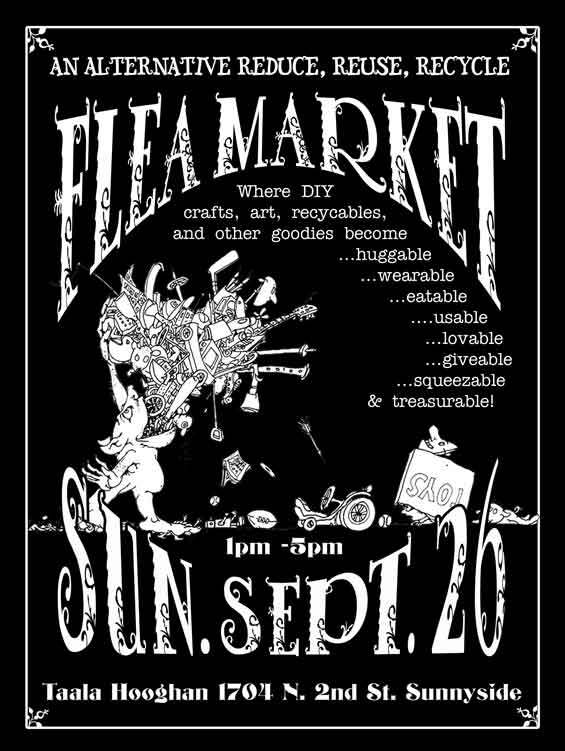 We have continued to offer skill-shares and events like silkscreen printing, Anartea discussions, hosting shows like battle of the bands, button making, blade-smithing, collaborative projects like the freebox (which continues to draw hundreds of people weekly looking to exchange and recycle goods) and are excited to say many new projects were created in 2012. A reorganized zine library with hundreds of zines from our friends across the state (thank you Catalyst Infoshop!) is in the end stages of completion while our community garden continues to expand as we’ve added a small seed library to the infoshop. On the collective front, we’ve been working to address colonialism and white privilege through discussion groups, collective meetings, and our day-to-day work. Part of the reason we will be closed for the month of January will be to address these collective dynamics and explore ways we can more meaningfully confront these issues in our greater community. 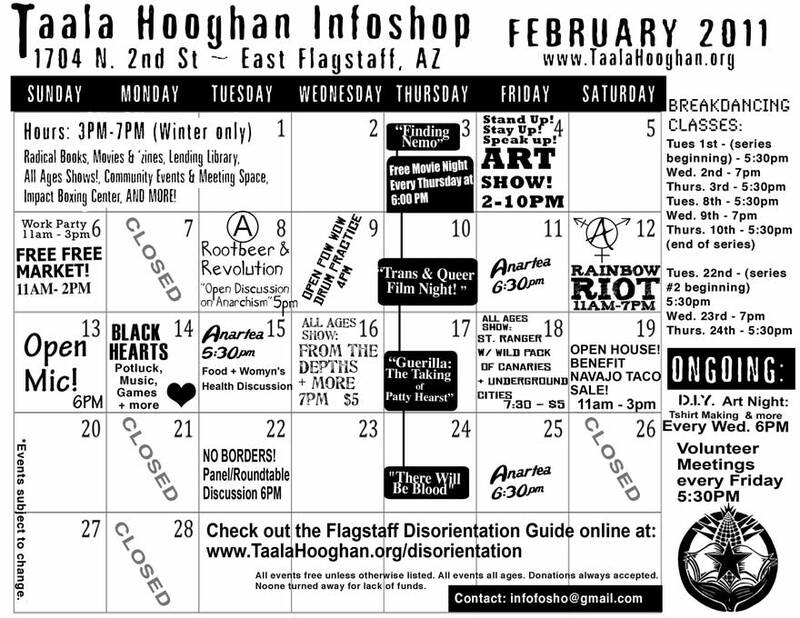 Snowmaking on the San Francisco Peaks, federal and local charges for members of our community and the collective, neo-nazi threats to our friends, and a renewed focus on restoring and maintaining the 1704 building have also marked Táala Hooghan’s very busy 2012 year. Aside from these challenges, we’re also working on expanding new and existing projects at Táala Hooghan. We have continued to use a light greywater system alongside our normal sewer system, supporting the outside recapture and reuse of rainwater for the community garden. A tool share has recently been initiated with the process of maintaining and adding tools to the collection begun early this winter. Many other projects are underway as well, as we continue to strive toward being a resource for information and the arts to our communities. Last but certainly never the least, we’ve also continued our jerk, drug, and alcohol free all ages shows (where nobody is ever turned away for lack of money)! With all this said, we’d like to take a minute and reach out to you for support. We’ve been extremely successful raising rent and utility funds through fall this year, but are coming up short funding rent, heat, and water for the winter months. If you or your friends and community can help us, it would assist us in continuing our operations through the New Year. Yard sales, benefit shows, auctions, food sales, “spanging” -however you roll, it helps! 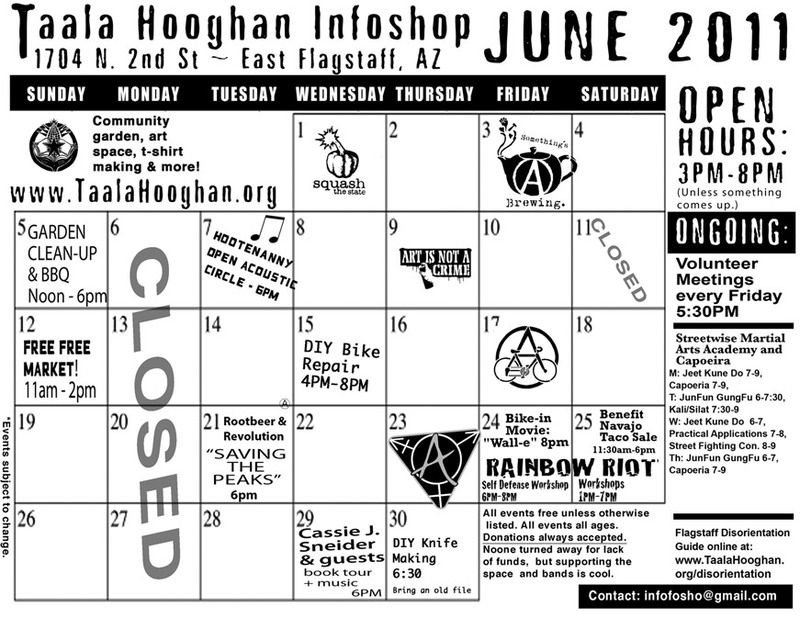 Or, if you’re in town, drop off/send check or money order to: Taala Hooghan Infoshop 1704 N. 2nd St, Flagstaff, AZ 86004. That said, we rely on 100% community support and are an all volunteer group. This means donations and all support goes to funding our basic needs to keep us in existence and helps in creating a space that supports radical politics, aimed toward social and environmental justice. working on internal agreements and maintenance of the space. *Support doesn’t just look like cash, either. We’re looking for volunteers and new collective members to help make this space live out its potential. Come to volunteer meetings every Friday at 5:30pm, or hang out during open hours. Donations of any kind – wood, stovepipe, and roofing materials are especially needed as well.